I help you resolve chronic digestive and hormonal problems and move you past the doubt, fear, and hurt to find your functional medicine solutions and spark up your body’s innate ability to heal, so you can get your energy and life back. Many of my clients tried so many diets, therapies, practitioners but still haven’t found what their body whispered to them — that their digestive system needed to repair the gut lining, to balance gut microbiome, to start absorbing nutrients, to naturally balance their hormones and more. By combining functional medicine diagnostics, years of experience with functional testing, experience in a clinical setting as a doctor of pharmacy, expertise with IBDs (Crohn’s and colitis) and my natural ways of healing, I created powerful personalized programs that will help you resolve chronic digestive problems to re-build a healthy gut, balance hormones, improve gut microbiome, and to find piece of mind. You are sick and tired of chronic digestive/hormonal problems. You really want to understand your condition's root causes instead of just patching your symptoms. You have been doing plenty of your own research about nutrition, relaxation, anti-inflammatory diets, etc. but you still can’t find the method which works for you. You know that you don't want to feel like a victim and you’re ready to live a fun, fulfilled life. You want to map out a more structured, functional and flexible way to eat for great digestion. If you feel that I’m the person to guide and support you in your journey, you can schedule your initial consultation to work with me. I help those with chronic gut problems and hormone imbalances, who are tired of having these issues that are holding them back from enjoying life and having energy. After almost a decade of practicing functional medicine I found the most successful way to work with a client. Working together requires commitment to success on both ends. So Schedule Your Initial Consultations only if you are ready to invest in yourself. I have Crohn’s disease and have been working with Dr. Inna since she started her practice. Her wealth of knowledge, guidance and genuine caring for her patients have been invaluable to me and my ability to stay in remission. Anyone deciding to work with Dr. Inna will get best of care. Dr. Inna Lukyanovsky changed my life. I am so thankful for her brilliance and compassion. Dr. Lukyanovsky is a gem among functional medicine practitioners and I recommend her expertise and guidance without hesitation. Following Dr Inna’s many protocols over the past 6 years, at 75 I feel stronger and more powerful! I’ve eliminated gluten and dairy and was able to greatly increase my levels of testosterone naturally. Thanks Dr. Inna for helping me live and love and feel the thrill of life everyday. Dr. Inna was instrumental in bringing me back from chronic fatigue, parasites and candida. I came to Dr. Inna in 2014 feeling depleted, tired, depressed and hopeless to find my way back to a good quality life. Over the course of 12 months I was healed and restored. I’m still working with Dr. Inna and value her knowledge and guidance. I continue to improve. My three children all have digestive issues. From a diognosis of Crohns to IBS. Something in our food system changed during their lifetime and they were all exposed to chemicals and genetically altered organisms. 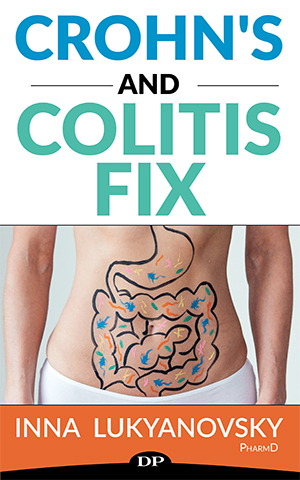 Reading “Crohns and Colitis Fix” is somewhat technical and explains in detail causes and cures. I found it fascinating because of my and my children’s history. I trust and believe in the field of Functional Medicine. The time is now to take responsibility for our own health; To be responsible for ourselves and look outside of traditional medicine for healers like Dr. Inna Lukyanovsky. Her book will start you on your journey back to health and wellness. Thank you Dr. Inna, for your dedication to helping people. I can’t refer you enough! Inna is truly one of the most compassionate and caring human beings in the world. She takes the time to listen and help you heal from the inside out. I was suffering with Crohn’s disease and felt hopeless with traditional medicine. I was tirelessly looking for an alternative and came across Inna…Needless to say she is a lifesaver. She helped me get my diet and supplements right and fixed my hormones and adrenals, It’s like a brand new me. I can’t recommend Inna enough, If you are struggling with any IBD or hormonal imbalances I believe she can help you if you follow her plan. In 2012, my husband and I lost everything in SuperStorm Sandy – our home, possessions and eventually my health. Conventional medicine was at a loss as to what was causing my debilitating symptoms and rapidly deteriorating health. Functional Medicine was able to scientifically diagnose all of my problems. Dr. Inna was then able to expertly guide me through several cleanses with an all natural protocol. I went from not being able to get out of bed to reinventing myself at age 62. Dr. Inna is passionate and 100% invested in my total welfare – body, mind and spirit. She is intelligent, driven and forever on the cutting edge. Her compassion is boundless. If you desire radiant, abundant health, call Dr. Inna, she has answers! Disclaimer: The views and nutritional advice expressed by Inna Lukyanovsky, PharmD is not intended to be a substitute for conventional medical service. Purchasing a product, program or wellness consulting does not establish a pharmacist/ patient relationship with her. If you have or suspect that you have a medical problem, promptly contact your health care provider. Our services are not indented for acute or life-threatening situations. Consulting services we provide do not replace the advice of a licensed physician, and all clients should be working with a primary care physician. We require that you continue to work with qualified medical professionals (MD) as you engage in our materials, products and services and share the wellness recommendations with them since it doesn’t only include evidence based medicine. No information offered here should be interpreted as a diagnosis of any disease, nor an attempt to treat or prevent or cure any disease or condition. Some information and statements regarding products and/or services made available by Inna Lukyanovsky, PharmD at Real Health Solutions, LLC have not been evaluated by the Food and Drug Administration. If you have any allergies to food, supplement or other substance, please contact the manufacturing company directly to learn if there are allergens present as we are not responsible for that. The supplements/products and services are not intended to diagnose, treat, cure or prevent any disease. Real Health Solutions, LLC DBA DigestiveReset.